In the run-up to the march and anti-gun protest, self described Black Panther organizers, including Jeelani Mutulu Haru Shareef, urged protesters to carry guns, “run up” on cops and use guns to take out cops who might hurt protesters. PCC women’s basketball coach John Slaughter, one of the organizers of the ironically named “Don’t Shoot” event, was also one the men conducting the pre-march instructions before the march and rally. Holding his toddler, Slaughter urged the crowd to get out of the way if they couldn’t hurt cops and let others do it for them. He yelled so fiercely to the gathered (mostly white) crowd that his toddler started crying. 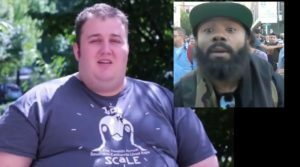 During the protest-march, Strickland was roughed up by a cell of Antifa protesters led by Ben Kerensa, the hefty 300 400 pound computer hacker, bomb hoaxer and professional protester. Kerensa is a multiple federal and state felon who’s done time in the penitentiary. Other thugs used their black bloc flag staffs to hit Strickland. Kerensa admitted later in court that he struck Strickland. He’s never been brought up on assault charges. When the same group tried to run Strickland out of the protest by coming at him again, he asked the crowd to stay back, as he backed away. As they continued advancing, Strickland grabbed his licensed Glock pistol and ordered them to stay away from him as he continued to back away from the crowd. His finger was never on the trigger. Shareef also menaced Strickland as he backed away from his attackers and followed him along a downtown Portland street. But it was Strickland who was arrested and charged with two misdemeanors, ticketed, and told to show up the next day in court. The next day, the prosecutor Katharine “Kate” Molina, presented hearsay testimony and lies to increase Strickland’s charges and his bail. As Strickland points out in his video below, Molina used a false police report to tie him to alleged threats suffered by protester none other than John Slaughter at an event the month before. “I’ve had a chance to review other reports, um, one specifically addressing addressing an incident on June 12th of this year, uh, where, uh attendees were going to a candlelight vigil in honor of the victims of the Orlando, um, nightclub shooting, and that Mr. Strickland was present and was, um, disrupting the vigil by taking videotape of the protest..er excuse me, the attendees who were there. Um, when one of the attendees, um, asked Mr. Strickland um, to leave, um, there was, um, some sort of exchange, I believe, and, within a day or so, that attendee started receiving numerous phone calls and text messages on a daily basis that were of a threatening and on a race based nature, um, and based on that attendees information about Mr. Strickland, whom he believes identifies himself as a white nationalist-anarchist, um, believed that Mr. Strickland was behind and orchestrating those threatening text messages and phone calls. The “attendee,” Slaughter, began getting calls and texts. That’s because the “attendee” insisted Strickland use his phone number in his video. In a video showing Slaughter approving of the violent anti-police rhetoric and pro gun speech at the anti gun event a month earlier, he also offered to give protesters his phone number. Apparently, this is part of his schtick. Strickland displayed the number in the Orlando vigil video. I don’t think Strickland should have included Slaughter’s phone number in the video, but that’s really not the point here. Where’s the call log of who called him? Where is the evidence of those voice mails and or text messages which “were frequent”and allegedly racist? Where’s the evidence that Strickland “orchestrated them”? Where’s the evidence of any “threats” received whatsoever? Surely, a deputy DA testifying before a judge should weigh actual evidence before depriving a person of their liberty. But that didn’t happen here. Well, if you’re a professional BLM and anti gun protester such as John Slaughter, this should be public relations GOLD! You’re the leader of your group and your allies are Black Panthers (black nationalists) AND YOU’VE FOUND A REAL LIVE WHITE NATIONALIST!! Send out the press release! But he didn’t, of course, because he knew Strickland wasn’t a racist. Worse, she assumed his assumptions that Strickland “identifies himself as a white nationalist anarchist” were true. Is “whom he believes identifies himself” the standard of proof now? And what the heck is a “white nationalist anarchist” anyway? Let’s ask John Slaughter. He apparently is the only one who does. What he did do was file a phony police report that Strickland never heard about until Molina used it to increase the charges and the bail. In short, a prosecutor’s reckless assumption based on phony and outrageous assumptions by Slaughter meant 21 charges and a $250,000 fine and thousands upon thousands of dollars in legal fees for Mike Strickland. Worse, he could have been sent to prison for 50 years on all the felony charges. As it was, he was deprived of his liberty for 40 days. It’s an outrage. As Strickland points out in his video, he lost his liberty over a false police report. If it can happen to him it can happen to you.